January 21, 2019 — Iqra University (IU) and the Philippine School of Business Administration – Manila (PSBA-Manila) signs a Memorandum of Understanding (MoU) which is drawn up and agreed upon to establish cooperation between the two institutions and for development opportunities, supporting and enriching the research activities, education, and organizin workshops and/or training programs in the field that will be beneficial for both parties. IU is located at Defence View, Shaheed-e-Millat Road Extension, Karachi-75500, Pakistan and PSBA-Manila is located at 826 R. Papa St., Sampaloc, Manila, Philippines 1008. Iqra University is chartered by the Government of Sindh vide Sindh Government Ordinance No.VI of 2000 having Campuses across Pakistan and has collaboration with foreign universities. IU offers a diverse range of graduate and post-graduate courses as well as PhD programmes of International level in Management Sciences, Computer Sciences and Engineering, Education, and Learning Sciences, Media Sciences, and Fashion Designing. IU’s mission is to be a world-class institution of higher education and research, promoting technical skills, critical thinking and public duty, to help develop and prosperous and progressive society. The Philippine School of Business Administration is a non-sectarian Higher Education Institution duly organized and created pursuant to the laws of the Philippines. Incorporated in 1966, it is also duly recognized by the Philippine Commission on Higher Education (CHED) and part of the United Nations Educational, Scientific and Cultural Organizations (UNESCO) and the International Association of Universities (IAU) so-called IAU/UNESCO List. THe main rationale of PSBA-Manila is to help meet the country’s management requirements for more advanced and sophisticated industrial and commercial life and government responsibilities. PSBA-Manila started its research arm for Disaster Risk Management researches and projects in 2006 and recently stated offering DRM Specialization in its existing MBA program. 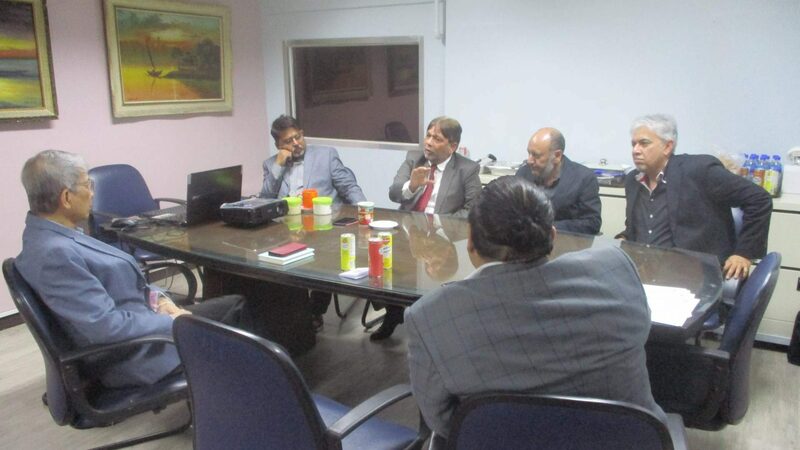 (From left, clockwise) Dr. Jose Peralta, Mr. Nasir Karim, Dr. Wasim Qazi, Prof. Ata Ur Rahman, and Dr. Tabassam Raza during the Media Management Academy Think-Tank Meeting. The signing of the MoU was done in PSBA-Manila during its Media Management Academy Think-Tank Meeting wherein Dr. Wasim Qazi, President and Vice Chancellor of IU and Dr. Shams Hamid, Dean of the Media Studies and Fashion Design of IU from Pakistan met with Dr. Jose Peralta, President and Dean of PSBA-Manila and Prof. Dr. Tabassam Raza, Associate Dean and Director DRM Unit of the Graduate School of Business, PSBA-Manila to discuss the possibility of establishing a Media Management Academy in the Philippines. The meeting was also attended by Prof. Ata Ur Rahman, International Consultant for the Media Studies Department of IU and Adjunct Professor of PSBA-Manila; Mr. Nasir Karim, Managing Director of ST Consulting International, United States of America; and Mr. Ernie Lopez, Senior System Analyst of PSBA-Manila. (From left) Mr. Lopez, Dr. Raza, Dr. Peralta, Dr. Qazi, Dr. Hamid and Prof. Rahman during the IU-PSBA MoU Signing. 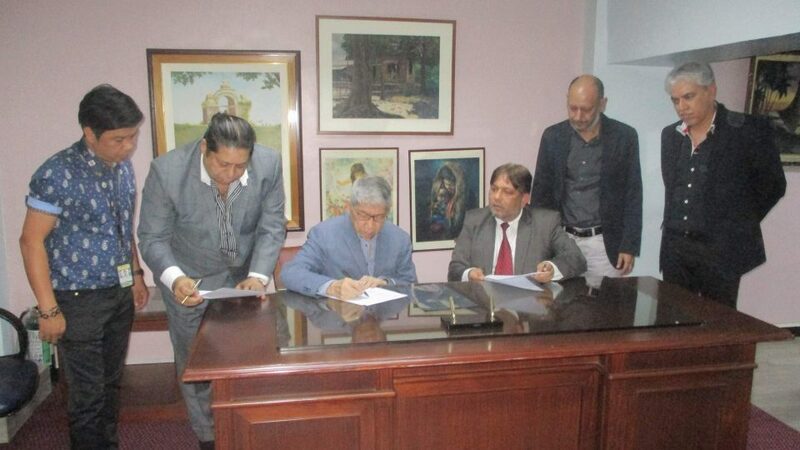 The MoU was signed after the meeting by Dr. Qazi and Dr. Hamid from IU and Dr. Peralta and Dr. Raza from PSBA-Manila. It was witnessed by Prof. Rahman and Mr. Lopez. It is publicly notarized on January 21, 2019 by Atty. Joaquin M. Chua at the City of Manila.